Sometimes a little cozy comfort food really hits the spot. Having recently discovered "Two Fat Ladies" - have you ever watched them? British hilarity at its finest - I was inspired to make my own version of one of their dishes...meatloaf. I have a meatloaf recipe that I have used for years, 12 to be exact, so when I watched the "Two Fat Ladies" make their meatloaf, I had to give it a try...omitting things like chicken liver, 'cause I'm just not in to that...actually, I changed so many of the ingredients that it really is no where near their meatloaf anymore, but it was totally inspired by watching them, so I must give them kudo's for that. 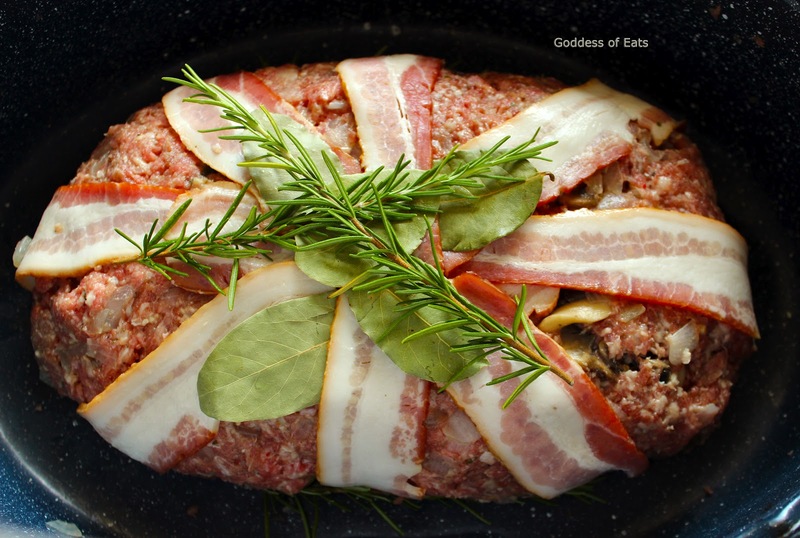 This maddening meatloaf is comprised primarily of four different kinds of meat: ground beef, ground pork, pork sausage, and ground veal. Place all of the meat in a large bowl and set aside. Saute one large onion and 6-8 large mushroom caps (with stems removed) in about 3 Tbs. of butter. When the onions are nearly translucent, add 4 cloves of minced garlic to the mix and saute a few minutes more. 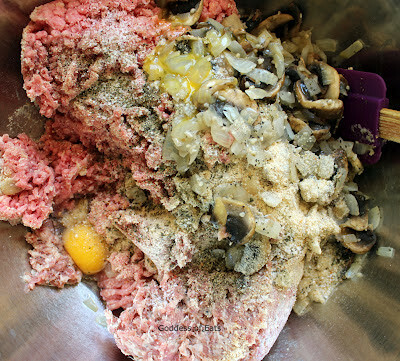 Pour onto the meat mixture and top with two eggs, 1/4 cup bread crumbs, 1 Tbs. Kosher salt, 1 tsp. black pepper, 2 tsp. basil, 1 tsp. thyme, and 1/4 tsp allspice. Mix together with your hands until well combined. 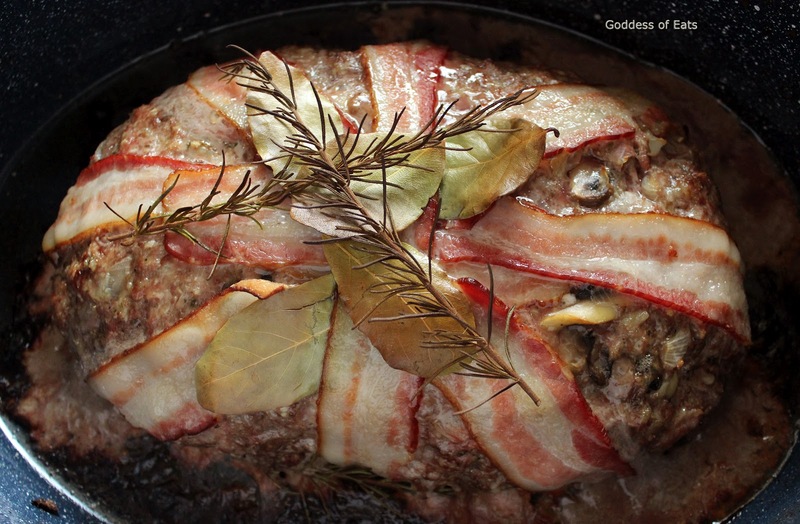 In a large roasting pan, shape into a loaf and criss-cross with bacon, tucking several bay leaves in and around the bacon and topping with sprigs of rosemary. Bake at 375 degrees until meat thermometer reads 165 degrees and meat is no longer pink, about 45 - 60 minutes. Combine meat in a large bowl and set aside. In a medium saute pan, heat 3 Tbs. of butter, add onions and mushrooms, sauteing 2-3 minutes, then add garlic and saute 2-3 minutes more or until onions are tender. Pour onion mixture into meat mixture and add eggs, seasonings, and bread crumbs. Using your hands, mix until well combined. Criss cross bacon across the top of loaf and tuck rosemary and bay leaves in and around bacon. Bake in a 375 degree oven for 45-60 minutes. Discard rosemary and bay leaves before slicing. Enjoy! 1. 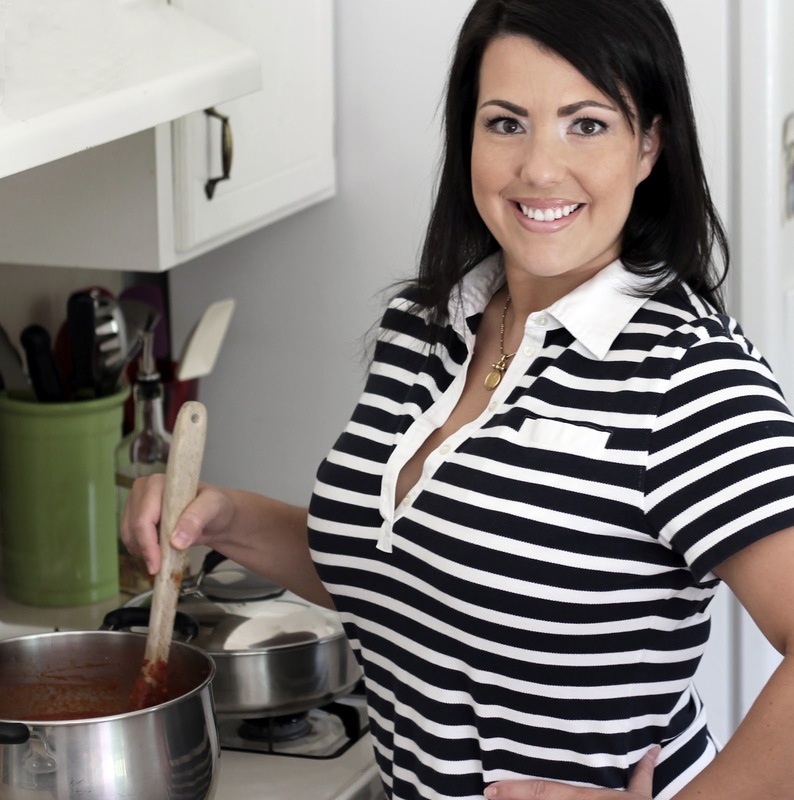 My new monthly food/lifestyle column with The Daily Sentinel of Nacogdoches! If you are local to me, please pick up this Wednesday's paper for a little sneak peek in their food section. 2. I am a breath away from having our cheesecake line, Stu & Abner's Cheesecake, ready for mass production and restaurant distribution! There are a few loose ends, some product packaging details and some streamlining kinks, but we are nearly ready and super excited to begin mega-marketing in September. Crossing my fingers and other extremities that one day this logo will be well recognized among it's peers. Any of you out there with an interest in business and marketing, we're gonna be looking for a few fun folks to help distribute samples at upcoming events, research packaging, and handle web updates. So email me: andrea@andreahoward.net if you think that sounds like fun (and if you happen to like working in a crazy environment with a crazy boss, that helps too). And, since we are officially an honest to goodness company, we can offer intern credit for school if you happen to be a marketing or business major. And finally, a hearty "THANK YOU" to all of my loyal readers for clicking over every now and then to see what's cooking in my crazy kitchen!! I've had a very busy summer - I really wouldn't have it any other way...after all, idle hands are the devil's workshop, right? It does seem that nearly every blog post of late begins with "busy" somewhere in the first two sentences. I'm so sorry if I sound like a broken record, but seriously - I'm kinda, sorta starting to feel a little in-over-my-head here! However, help is on the way! 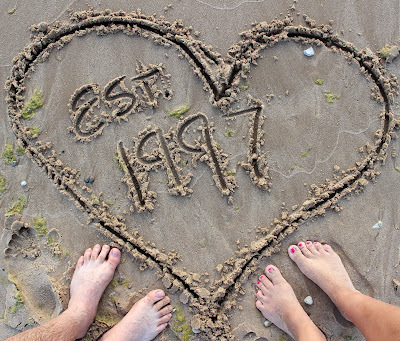 My 1 year old and 2 year old begin preschool in exactly 29 days - I'm totally counting down to this monumental occasion. Yes, I know it's a bit strange to send the little guys to daycare while I homeschool the older two, but I need some help here. In addition, I have a super, duper helper lined up to begin working for me September 1 and I can't wait! One more month and I will feel like a new woman. If you've known me for longer than...well, a minute...then you know that I "heart" tomatoes! We planted nearly 70 tomato plants this year and have been enjoying the bounty for the last month or so. Tomato sandwiches, red sauce and salsa top the list of our favorite uses. I like to experiment with different variations of salsa - everything from simple pico de gallo to a full flavored variety of ingredients. This salsa definitely falls into the second category. I hope you enjoy it as much as we did! Combine all of the above ingredients in a large bowl, stir well to combine and then refrigerate for 24 hours to allow the flavors to marry resulting in the best flavor. Patience is the hardest part of creating this salsa! Enjoy! 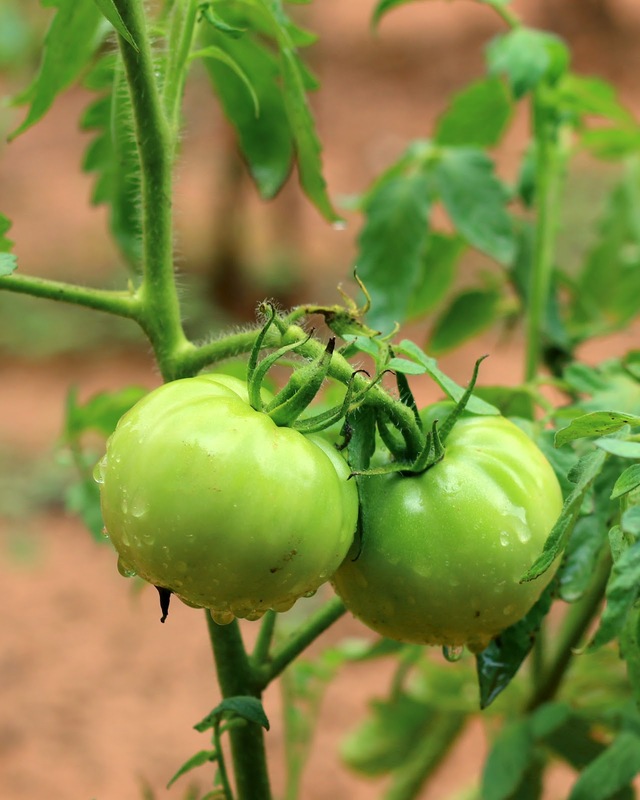 Mighty salsa comes from once green tomatoes! I love a good red sauce. I wish I could share my favorite red sauce recipe here, but mine is in "the vault" - the vault being a fictitious location deep within the recesses of my mind, where I tuck away methods that have never been written down. Within the vault I salt away a few of my most cherished formulas - I hope I don't end up with Alzheimer's. Anyway, for this Caprese Chicken you will have to, unfortunately....get your own red sauce. Such is life. Red sauce aside, this is the simplest, easiest, most convenient go-to recipe for flavor and speed. We're having it again today. 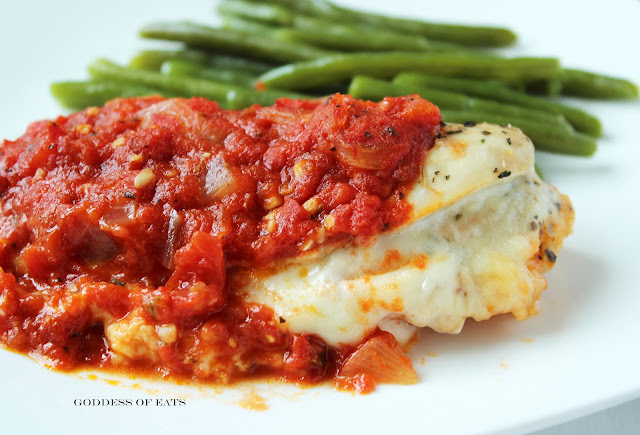 It meets all South Beach diet standards and pleases everyone around my crazy kitchen table. Or at least, they're all smart enough to clean their plates without complaint. Either way, I've trained them well. Top the seasoned chicken with your red sauce. Cover with foil and bake at 400 degrees, for 20 minutes, or until chicken is no longer pink in the center, removing foil after 15 minutes and baking uncoverd for the remaining 5 minutes.